How To Use The Forum Tools. Well I had alot of time on my hands so I thought with the amount of new members joining and a few of the ones allready here who probably dont know what some tools are , I have done a short summary about how to use some of the tools , to take forum experience to the max. Would like it to be stickied as a feel it my prove usefull. To do this you type in your word which you want to use in this case its "something" so type in "something". Then higlight the word "Something". This is your word which is representing the page you want to direct readers to. Once selected go to the icon above the world with a pair of sun glasses next to them and click. when the box appears after you click it , simply enter the Url adress that you want people to go to when clicking your word. So> Enter word> Higlight> Click Icon> EnterAddress. Then you should have Something. Multi-Quote is when you quote more than one post at a time. Often used. First of all quote the first post you want as you normally do. Selected the icon in the picture , Its hard to see but its the speach bubble with text in it. Now enter the name of the person you want to quote and enter it after the "=" sign. After doing this simply copy and his paste post from the thread which should be below your post. now you have [Q.UOTE=RossDAFC]I am Scottish. So in a simplier way. Then After the "=" Enter name of forumer you want to quote. Copy his post into the middle of the quote tags. You should be able to multi-quote. There are many ways of getting an image into a post. The first way is ' date=' get an image from lets say google. type into your search engine chelsea badge. go onto a image that you feel is right for your post nand click on it to get its direct link. once you have this copy and paste it into the box that will appear after clicking the box above which is a yellow box with a mountain on it. when you put your link into it then press ok your image should appear. If a photo is on your computer you can upload it by signing up to something like imageshack or my favourite Photobucket. 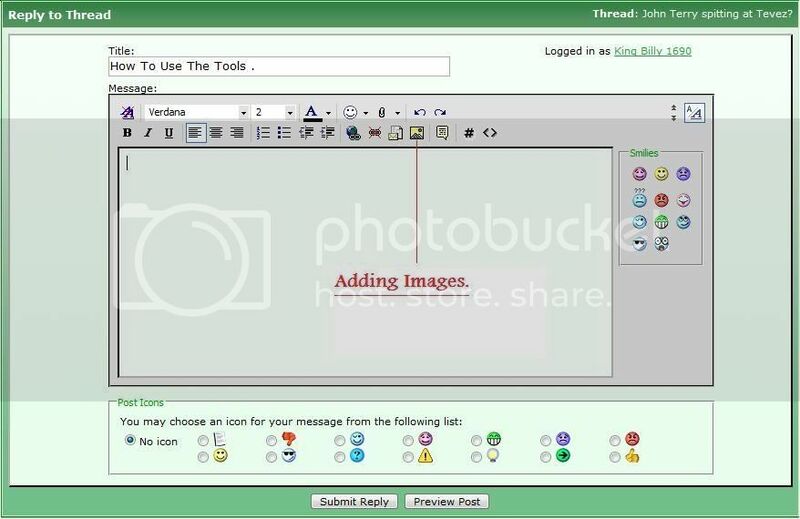 This allows you to get your images on the net. You will be directed on one of these sites and they will tell you how to get the image code/link. once you have it , it will have [i.MG] [/img] tags around it. You now have a image on your post. This is also how to post screen shots as you take a screen shot by using the print screen button and paste it in paint , save as a file then follow the step above and you have a screen shot. Its nothing great , just passed 40 minutes , hopefully its usefull for some. If ther is any problems with it Pm me dont leave a comment on the thread and a cant then change it. Also if this has allready been coverd pm me with the link and all get a mod to merge or delete thanks. Re: How To Use The Forum Tools. a hope people find this usefull , if it is hard to understand just give me a buz and all try explain it to you better. Mate your just bumping a 11 month old thread. Well its for you to search threads you want or if you want to create a thread, just use it to see if there is a similar thread to the thread you want to create. This is also how to post screen shots as you take a screen shot by using the print screen button and paste it in paint ' date=' save as a file then follow the step above and you have a screen shot. Do you (or anyone else) have any idea how to do this on a Mac? Apple Key + Shift + 3. The truly legend of SM Forum. Thanks man, that's revolutionised my world! And I didn't know that, I even see him on the SM database which is kinda cool! I didn't know that, I even see him on the SM database which is kinda cool!